But you probably don't mean what I call it... but what it's correctly called. Anyway there is no Himling. And I apologize. And there is reference to "lands under the wave". I thought like Tinuvial that the wave was from the destruction of Numenor, but it does make a lot more sense that it's from the War of Wrath. Iluvatar's not THAT much of a prick. I suppose what's always bothered me is that the second age begins with the downfall of Sauron, not of Morgoth. Should at least slip another age in there between the two. It can be a weird feeling re-reading posts I made 6+ years ago. I had totally forgotten about the :ugeek: and :mrgreen: emoticons until seeing those codes in the copied posts. Fonstad's book is still pretty great but I'm not longer so keen on the whole idea of stitching together ideas from different eras of the legendarium. Showing Beleriand and Eriador next to each other isn't necessarily an issue, but I'm not totally comfortable making the leap to grafting the famous map of northwest Middle-earth onto the Ambarkanta map since Tolkien did not do so himself and his views of the cosmology of Arda continued to shift for decades afterwards. halfwise wrote: And there is reference to "lands under the wave". I thought like Tinuvial that the wave was from the destruction of Numenor, but it does make a lot more sense that it's from the War of Wrath. Iluvatar's not THAT much of a prick. I suppose what's always bothered me is that the second age begins with the downfall of Sauron, not of Morgoth. Should at least slip another age in there between the two. I am extremely behind on sleep so I might be misunderstanding you, but the Second Age did begin immediately after the overthrow of Morgoth, though that had a major impact on Sauron as well of course. Semi-related tangent: I have always felt that the destruction of Númenor paints Ilúvatar in a pretty bad light, but that debate usually ends up being more about people's opinions on Primary World theology than anything specific to Tolkien's legendarium. Yeah, I'm embarrassingly mixed up here. let me change my statement: I don't understand how the changing of the earth from flat to bent can be ignored in the ages of middle earth. The war of wrath definitely was worth a change of age, but come'on, bits of one continent were gouged out. Can't compare to the whole cosmos changing. Perhaps Sauron being defeated but not destroyed just wasn't good enough to start a new age? Eldorion wrote: Fonstad's book is still pretty great but I'm not longer so keen on the whole idea of stitching together ideas from different eras of the legendarium. 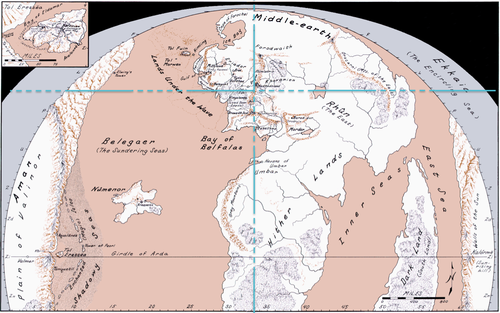 Showing Beleriand and Eriador next to each other isn't necessarily an issue, but I'm not totally comfortable making the leap to grafting the famous map of northwest Middle-earth onto the Ambarkanta map since Tolkien did not do so himself and his views of the cosmology of Arda continued to shift for decades afterwards. Huzzah Eldo, I agree about conflation. There's even a bit in the map of Tol Eressea above, which I disagree with, and I've already raised the matter of Tol Fuin and Himling not necessarily being carried forward into 1950s geography [in my opinion at least] -- and that they are, in any case, not on any published map approved by Tolkien himself. I still recommend Fonstad's book in general, but even she warns that some of her conclusions are necessarily based on thinnish ice. As for the world made round, I myself don't believe it actually happened... for me it's a mannish myth just like the Last Battle at the end of days. I tend to lean towards the round world interpretation of "The Silmarillion" as well both for plausibility reasons (as described in "Myths Transformed) and because I think it tends to be more consistent with LOTR (and I think both works are elevated when it's able to consider them as two halves of a larger whole). The most curious aspect of the World Made Round, to me, is how it seems to have been continually revised into a less and less consequential event. Back in the Lost Road era Tolkien did blame the sinking of Beleriand on the events of the Downfall, but by the time LOTR was in print its geographical impact on the Hither Lands seems to have been limited to the creation of the Ethir Anduin and the reduction in size of Tolfalas. Pelargir ended up further inland as a result but IIRC none of the other port cities whose history stretches that far back (Mithlond, Vinyalondë, Edhellond, and Umbar) were described as being impacted even that much. I could be forgetting something, though. The Elves still sail to the Undying Lands via the Straight Road but the mechanics of this are unclear, in part because Tolkien never followed through on the massive amount of re-writing that would have been necessary to fully implement his most radical reconsiderations. My personal explanation is that Aman ends up in a pocket dimension of some sort. Unlike the Timeless Halls of Eru, though, it can't be wholly outside the physical universe (Eä), because the Valar's power/domain doesn't extend beyond that. Though it's also worth noting that the round world cosmology includes a universe that is as vast to our own (or at least as vast as it was understood to be in the late 1950s), so the Valar are even more focused on Arda, which here means the solar system, to the exclusion of the rest of Eä. Since Tolkien's development of the round world cosmology was largely motivated by a desire to be more consistent with primary world astronomy, and since we know from astronomy that there is nothing like the continent of Aman in any observable part of the solar system, I lean towards higher dimensional wackiness as the explanation. But I don't necessarily think Tolkien would have considered things in those terms, and of course the round world version of "The Silmarillion" still includes plenty of divine/angelic powers that we would consider supernatural, so the explanation can fall back on "a wizard God did it" to some extent. I can sort of see the reasoning of flat-to-round as a mannish myth because it's man what done it, and claiming men are important enough to warrant such a change in cosmic structure smacks of pridefulness. But it's still one of the most original and beautiful images in fantasy literature, so I'm loth to give it up as "real". It's only the niggling fact that there was no transition of ages that makes me regretfully accept that, at least by the time he was writing LotR, Tolkien never totally bought into it. The downfall pretty much resulted in a reset for all parties rather than good becoming dominant. The greatest 'good power turned baf and got destroyed simultaneously weakening what lower Sauron had. More like a 'ctrl+alt+del' reset than moving to version 3.0.